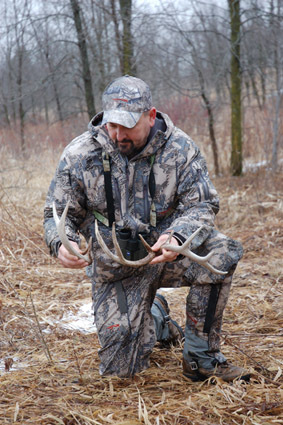 Now is the time to map obvious, easily read sign to help you pattern those many-tined, "holdover" bucks. Trophy bucks are always giving bowhunters fits. And yet, some true monsters can be so predictable that if you do a certain amount of necessary off-season scouting and research, they can be yours. So here''s some good, hard-won advice: Get off your duff and get into the deer woods. Get out there right now, not next month, not this summer or this fall. The reason for scouting "now" is that the woods will never look the same (until next year at this time, of course). The landscape is very special right now for the simple reason that it''s riddled with tattletale deer sign. Everything from rut sign to trails and beds and droppings sticks out like a neon sign. Then there are the naked trees, bare branches and leaf-carpeted hills and valleys that can teach you more in an hour than you’ll learn from a month of late pre-season scouting. Put another way, deer have been carving out travel patterns for several months that beg exploration. And the best news is that what you see now is what you''ll probably get next hunting season. And probably is always better than maybe. Have you ever seen one of those multi-thousand-piece jigsaw puzzles? They remind me of patterning whitetail routes. With a rub here, a bed there and a scrape over yonder, you just never know what the "big picture" is until you have all the "pieces" in place. Well, that''s precisely what this journey is all about. Your two-fold goal is establishing "deer activity routes" and then pinpointing where bucks are most vulnerable. That may sound familiar, but it''s so much easier to pull off now with so many more pieces to your puzzle. The starting point is getting organized. In a word, you need maps. Nowadays there are numerous high-tech sources for detailed maps: DeLorme, Maptech, myTopo, Topozone, Maps a la carte, High Performance Database Research Center (Florida International University). For my neck of the woods (the Midwest) the old standby, the USGS topographical "quadrangle map," is hard to beat. A handy source is www.mytopo.com, where you can order a personalized map with your hunting area placed in the geographic center (no more cutting and pasting). It''s also possible to "customize" your own map on-line at the topozone.com website. But this is only the beginning. To really "see" what you''re looking at, you need to blow the map up. Many office supply chains offer this service. But if you have access to a color printer with a "zoom" feature, make your own enlargement; about 200%-400% will do. Now you’ve got a great base map to plot deer sign in relation to key terrain features. Today''s chore is merely recording what you find as accurately as possible on your blow-up. Then next fall you''ll be way ahead of the game. unlike food preferences, key bedding areas rarely change from year to year. (While a farmer may leave a field fallow, or a dry year may fail to produce a decent mast crop, traditional security cover generally survives from season to season.) As a consequence, once you identify where bucks like to bed, you’ve got the hub of deer activity wired. Like spokes of a wheel, everything revolves around bedding areas. Next, plug in various wind quadrants. As you snoop about, check the wind periodically to see which directions dominate your hunting area and how thermals interplay. This, in turn, determines access routes, the final pieces of the puzzle. Indeed, getting in and out undetected can make or break a spot, so never cut corners on this aspect of post season scouting. So besides the wind, other variables to consider include: where and how to ford creeks, rivers, and swamps during high-water conditions; maintaining a low profile around fields and forest openings; and avoiding security cover along the way. 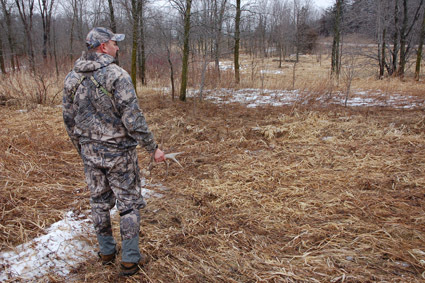 Early spring scouting is the best way I know to get a handle on deer patterns. 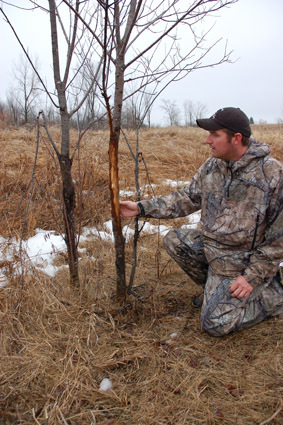 In my book it''s almost as good as seeing a worthy buck more than once under the same tree. When that happens, you''ll probably get a shot at that deer. And, like I said, probably is always better than maybe.